InstantCert Academy helped pioneer online exam preparation for college-level tests. They currently provide study materials for the GED, CLEP, DSST, and the ECE exams. Homeschool teens can take CLEP exams while still in high school. This allows them to earn college credits for courses they are already studying. 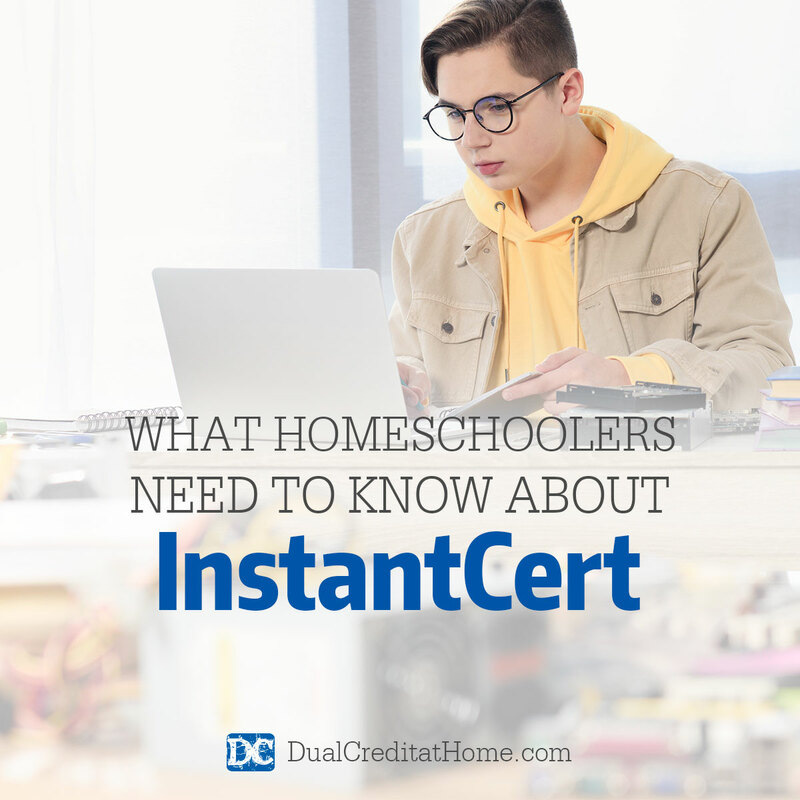 Dual Credit at Home recommends InstantCert as part of our program. RELATED: Get our free e-book to learn how our family used CLEP exams to save over $300,000 on college degrees! InstantCert is based on Interactive Textbook Computer Based Testing (ITCBT) software. This study method uses fill-in-the-blank questions on interactive flashcards. Different portions of the practice question are blanked out each time. This gives students a comprehensive overview of the subject. There is also an optional audio accompaniment to help reinforce key topics. InstantCert’s helpful forum includes thousands of students who are taking the exams or who have taken them in the past. The forum is a valuable asset for students who have questions as they prepare for the exams. What Does the InstantCert Subscription Include? A subscription includes study materials for over 60 courses and access to the forum. The study materials are accessible on a computer or free iOS and Android apps. How Much Does InstantCert Cost? InstantCert offers a monthly subscription for $20 per month. Students can also sign up for six months at a time for $108 ($18 per month). There is an unconditional money-back guarantee for the first 30 days. Does InstantCert Provide Access to Actual Test Questions? No. The interactive flashcards teach students the fundamentals of the subject. The exams themselves reflect content covered in a standard undergraduate course in each subject. InstantCert materials give students a comprehensive overview of the subject. This helps them master the material and pass the exam. Dual Credit at Home’s Study Plans include InstantCert assignments in order to help students be prepared to pass CLEP and DSST exams.